I had given up on the prospect of ever being able to eat pizza at a restaurant ever again. My husband went to Peace A Pizza last weekend to get some lunch for himself and a friend, and he told me they had gluten-free pizza now! I was beyond thrilled. I thought about it for days. I really wanted some. One night when I got home from work last week, I decided we were having pizza for dinner. I couldn't wait any longer! 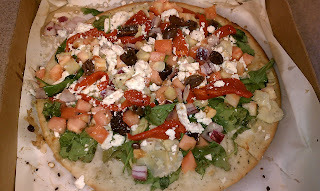 I ordered the Mediterranean Salad pizza from Peace A Pizza. 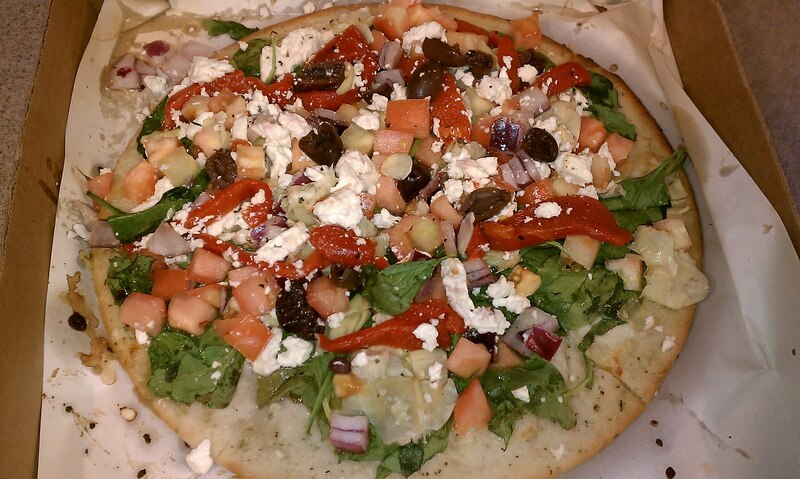 It has spinach, olives, artichoke hearts, tomatoes, onions, roasted red peppers and feta on it. The crust wasn't as thick as their regular pizza, but it was delicious. I would definitely get this again. I am so happy to have an option for pizza now. If you're on a gluten-free diet and have a Peace A Pizza near you, I highly recommend trying this! I love roasted potatoes, especially the baby, fingerling potatoes. They have the nice, thin skin and are so tasty. They also don't take hours to bake like a regular potato. 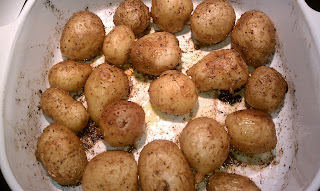 For a normal serving, I usually cook 6-8 small potatoes per person. For two people, combine 12-16 baby potatoes with 2 tablespoons of olive oil in a baking dish (I love to use St. Helena Garlic Olive Oil for this). Toss to coat. 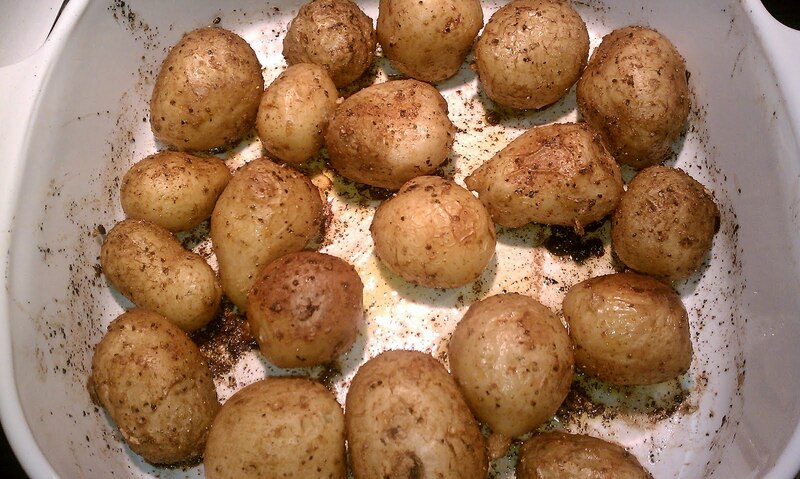 Sprinkle potatoes with my Savory Seasoning spice. Mix well to coat all sides of the potatoes. Bake in a 400 degree oven for 25-30 minutes. Potatoes are done when they feel soft when pierced with a fork. This is sort of like giving away my secret sauce, but I've had a few requests for this particular recipe. For Christmas 2009 and 2010, I made huge batches of this spice mix and gave it away as gifts to at least a dozen people each year. It's very versatile, and can be used on beef, chicken, fish, vegetables or potatoes. Since it can be used on so many different things, it can get used up very quickly! As you can see from my army of bottles below, I make huge batches of this stuff. Costco is a great place to go and buy the ingredients for this recipe. 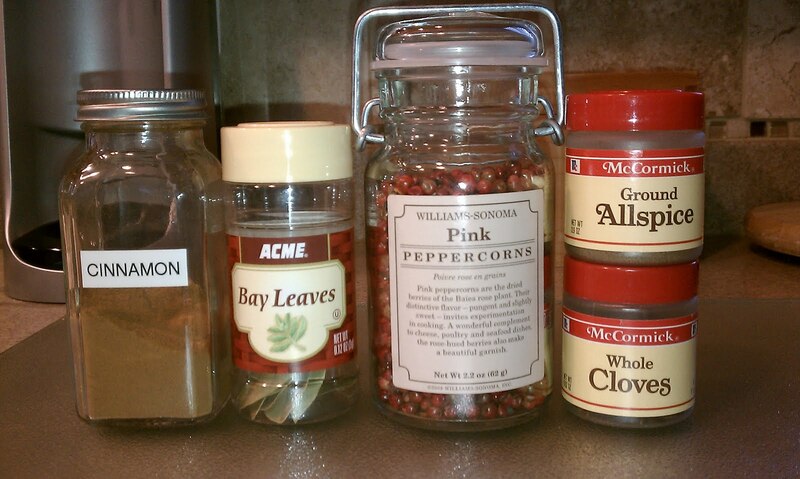 The only ingredient that I have a harder time finding is the celery seed. Once mixed well, put into a spice jar. There are so many disposable cleaning products on the market today. It's kind of depressing. Disposable dusters, mops, toilet bowl brushes, you name it. Not only are these products wasteful, but they're expensive and filled with chemicals. I used to buy Swiffer Wet Jet mops back when they first came out about 9 years ago. Then I realized, how wasteful they were. You can't refill the cleaner bottle, and the Swiffer pads can only be used a few times, and then have to be thrown out. Not a good idea. From there, I switched over to a reusable microfiber mop. This is a much better concept, with reusable microfiber pads that can be washed in the washing machine. Right now, I'm using the Scotch Brite microfiber mop. 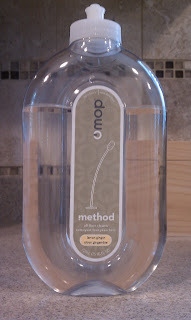 I also use the Method oMop, but it's a bit smaller and the head tends to flip over a lot while mopping. Rather than slopping around with a bucket, I was using oMop floor cleaner, and then just spraying it on the floor as I went. I ran out of oMop cleaner one day, so I decided to make my own. Since the oMop bottle can be refilled, I made my own recipe and saved some money! 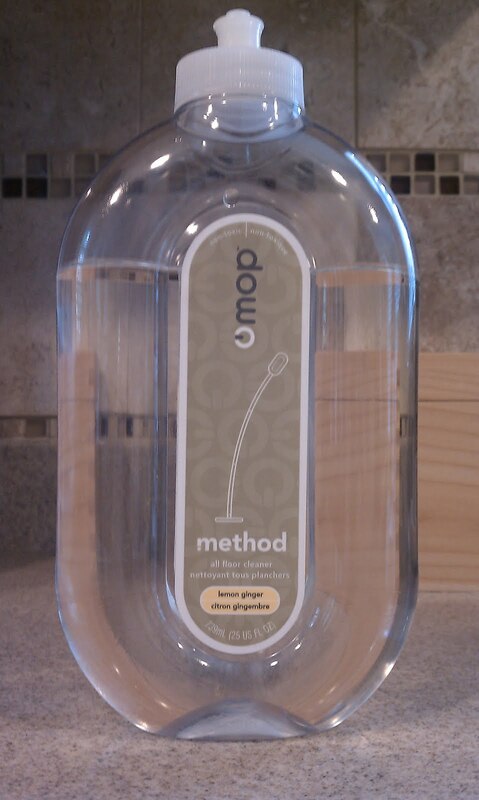 If you don't feel like making your own floor cleaner, Method's product is a good eco-friendly alternative, and it works well and smells very nice. Combine all ingredients in a squirt bottle and shake to mix. 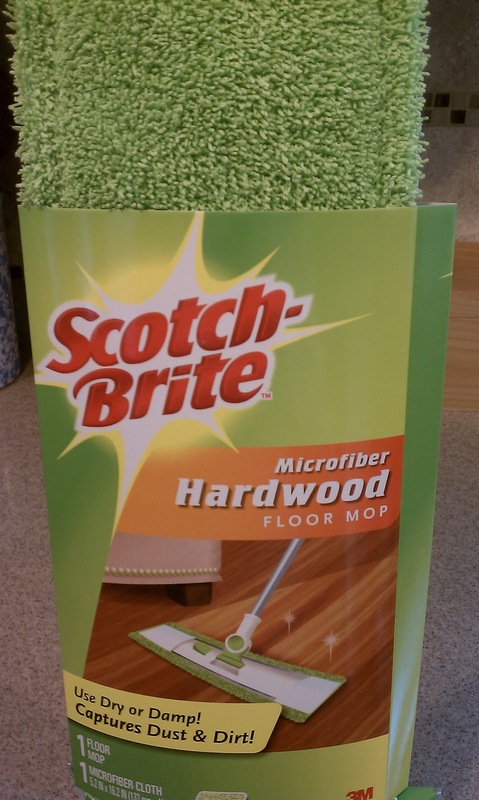 The bottle below is great for mixing up my own floor cleaner, but any squirt bottle will do. You probably already have these ingredients in your house. If not, run over to your neighborhood Costco or Sam's Club and buy a huge bottle of white vinegar. I promise, if you want to make your own cleaners, you'll make good use out of a large bottle of vinegar. Check out my drain cleaning tips and homemade kitchen disinfectant for other great uses for white vinegar. If you don't have any essential oils, it's not necessary for the recipe. The vinegar smell will dissipate after 10 minutes or so after mopping. If you don't want to invest in a reusable microfiber mop, just use rags to wipe the floor. I bought a huge bag of plain white rags about 8 years ago, and I use them now for everything. I rarely use paper towels for anything. I just keep rags in drawers around the house, and then just wash them in the washing machine with hot water and hydrogen peroxide bleach. The rags will pay for themselves in about a month! My freezer is a disaster. I usually try to keep similar things together on each shelf - one shelf for veggies, one for fruits, one for proteins, etc. 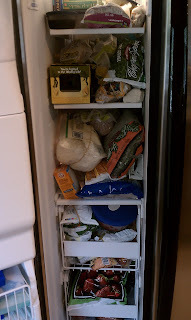 When I get to the point where I have no idea what's in my freezer, I know it's time to reorganize. I think things started to go downhill when my husband left a bottle of champagne in the freezer to chill, which then exploded. The freezer was torn apart to clean up glass shards, and hasn't been the same since. One of my favorite tips for organizing the freezer is this - wear winter gloves! It becomes painful to handle frozen items with bare hands after about the first minute. I accidentally came across this idea one winter, when I came in from grocery shopping, and kept my gloves on while unpacking my groceries. I thought to myself...why don't I keep my gloves on every time I'm moving things around in the freezer? Give it a try. 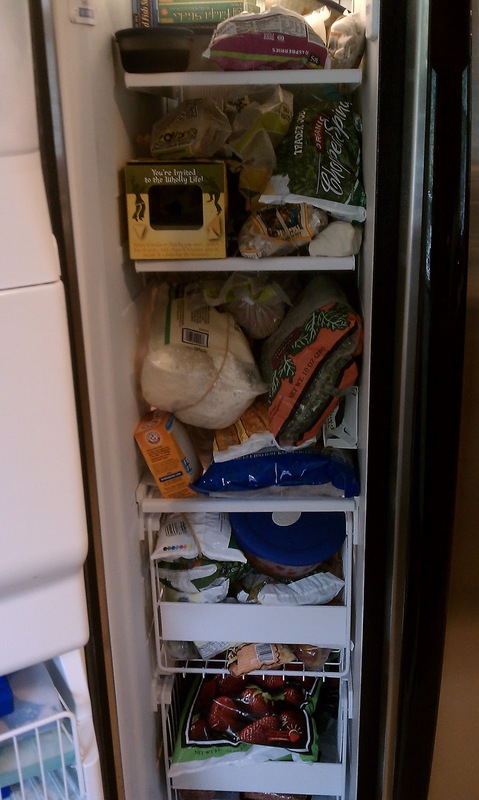 You might find yourself organizing your freezer more than once every 5 years. My sister-in-law had a nice pair of white Ralph Lauren shorts that got discolored. She tried washing them a few times, but they remained yellowed. I tried using Oxy Clean, Laundress Stain Remover, and even a bleach pen, but nothing worked. I thought it was a shame to throw them out, so I decided to try dying them. The shorts had navy blue anchors on them, so we thought a light orange color would look nice. We used Rit powder in Tangerine for this project. 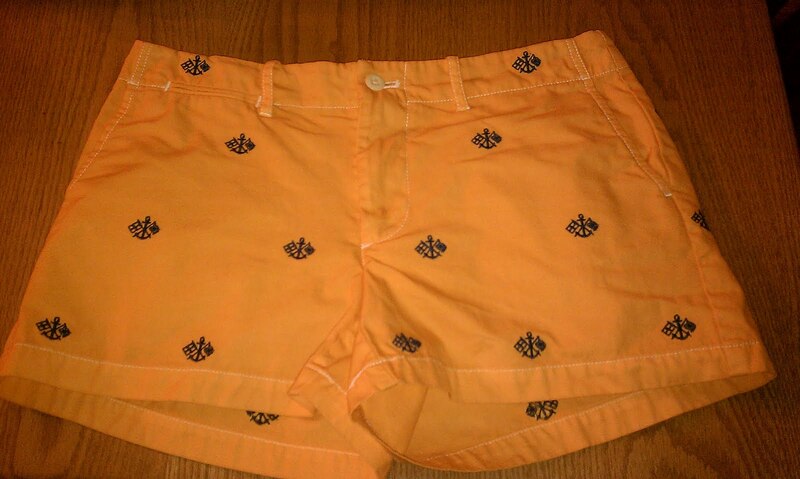 For a little over $2, I saved the shorts and they look like new. If you have anything was was "formerly" white and made of cotton, I highly suggest trying to dye it, rather than throw it out. It will almost be like getting a new piece of clothing! You can get a box of Rit dye at any Michael's craft store. It's easy to dye anything in your washing machine. Just make sure to follow your dye cycle with a cycle of hot water and a cup of bleach to prevent dying anything else you put in your washing machine! When it was 90+ degrees outside for days on end, I really didn't feel like turning on the oven or stove. I surveyed what I had in our CSA box, and we had a few zucchini, and some fresh basil. I had a bit of leftover fresh mozzarella, a jar of spaghetti sauce and some black olives, so I decided to make some raw lasagna. It's nice and refreshing on a hot day. 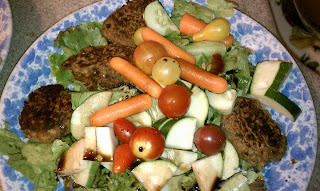 This is a recipe I created last summer when Lee and I were on an extremely restricted diet per our doctor. It was so tasty, I've been making it ever since! When I originally made it, we couldn't have dairy, so I pureed some lentils to make a sort of "lentil cream" in place of cheese. You could probably also just put a layer of cooked lentils in place of the mozzarella. 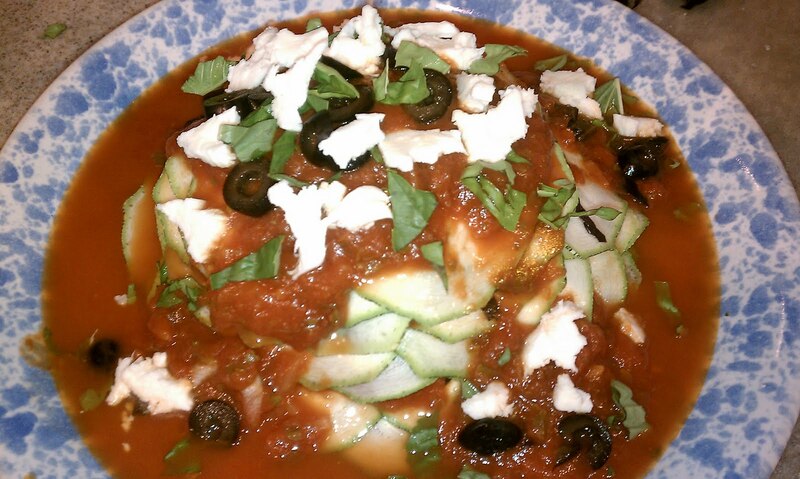 Either way, it's a nice alternative to lasagna made with pasta noodles. 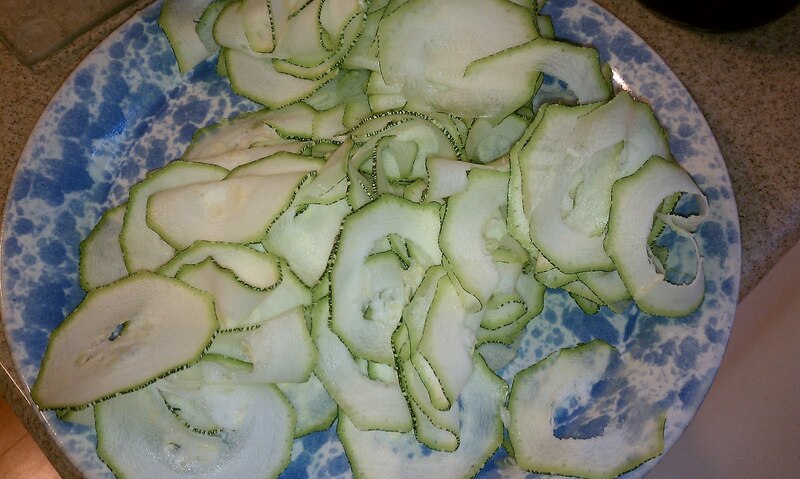 Using a mandoline, slice zucchini into thin circles. 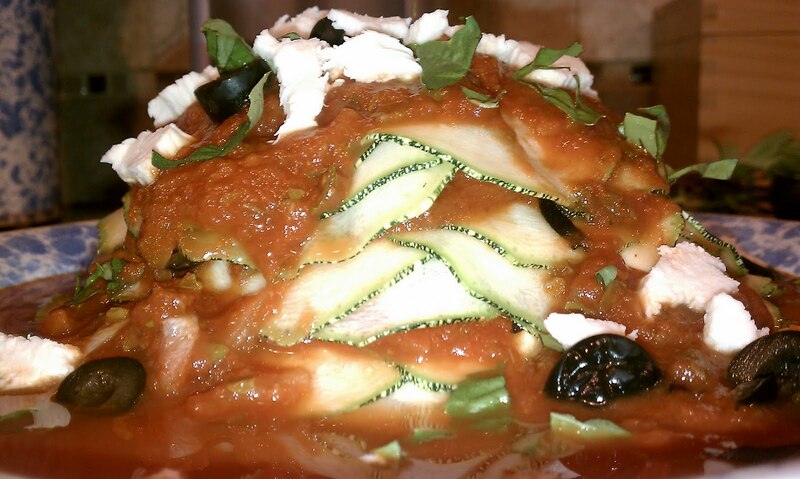 You will have a huge pile of slices from one zucchini. You'll end up using these slices to make your layers of "noodles." I make each serving separately on a plate, rather than one large serving. It makes for a nicer presentation. Once you're done slicing the zucchini, start to create a layer of slices as a base. Add a few tablespoons of sauce on top of the zucchini slices. 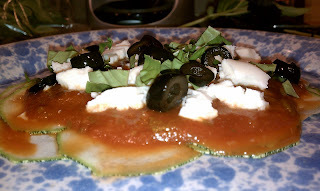 Add some bits of mozzarella, a few snips of basil leaves and few slices of black olives. Repeat this 3-4 times, depending on how large you want your piece of lasagna to be. I had about 4 layers in the photo below. I laid out the zucchini slices in a nice pattern in this one, but you can also just throw down a bunch of slices and then put on the toppings, and it tastes just as good! In general, Americans don't eat enough fermented foods. In other countries, fermented foods are consumed daily. Aside from yogurt, we really don't have anything in our diets that contain helpful probiotics, which improve our digestion and overall health. 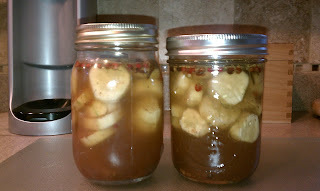 I came across a recipe for raw pickles that contain probiotics. This recipe is easy to make and doesn't require much hands-on time. I didn't have pickling spice, so I ended up putting the following in each jar: a bay leaf, a few peppercorns, a few cloves, a sprinkle of allspice, a sprinkle of cinnamon, a few pieces of fresh dill. Combine all ingredients into one large canning jar or 2 smaller jars. Close the lid tightly and shake well to mix. Leave out on the counter for 3-4 hours. Place in refrigerator overnight. These will keep for a week or more in the refrigerator. I haven't had any sort of spray cream or whipped cream in the house for a while now. We've cut out most dairy products from our diets (aside from some occasional cheese), so I haven't bought any of my favorite Cabot Whipped Cream (which is the best spray cream out there, if you haven't tried it!) in a long time. 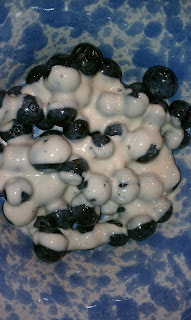 I bought at pint of blueberries at the Central Market in Lancaster on Friday, and I wanted to have them for dessert. Just plain blueberries was kind of boring. I decided to make some Cashew Creme to put on top of them. It's really delicious, and doesn't have any added sugar. It also has coconut oil in it, which also has lots of health benefits as well. You can make this up and it lasts in the fridge for about a week. 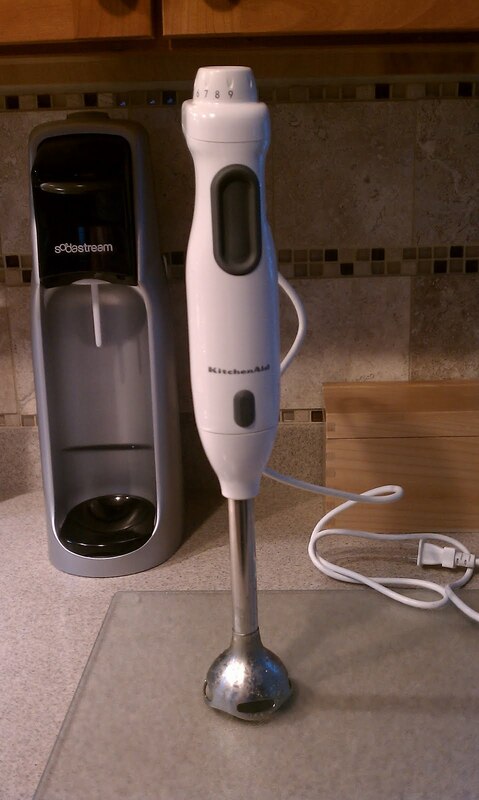 Use it as a topping or dip for fruit, ice cream, cake, brownies, etc. I found a recipe for Lentil Fritters in Real Simple Magazine, which is one of my favorite magazines (if you haven't read it, I highly recommend it!). Lentils are a great source of protein, so if you're trying to find a replacement for animal proteins, this recipe is a real winner. The orginal recipe used the fritters in a wrap with some shredded cabbage, but you can use these in many applications - as a topper for salads, as a burger replacement, or even on top of pasta as a meatball replacement. They're very tasty, and you can make a bunch at one time and then just reheat or even eat cold. In a food processor, puree 1 can of the lentils with the cilantro, parsley, garlic, and cumin until nearly smooth. Transfer to a bowl and mix in the bread crumbs, the remaining can of lentils, ½ teaspoon salt, and ¼ teaspoon black pepper. Form into 16 ½-inch-thick patties. Heat 1 tablespoon of the remaining oil in a large nonstick skillet over medium-high heat. 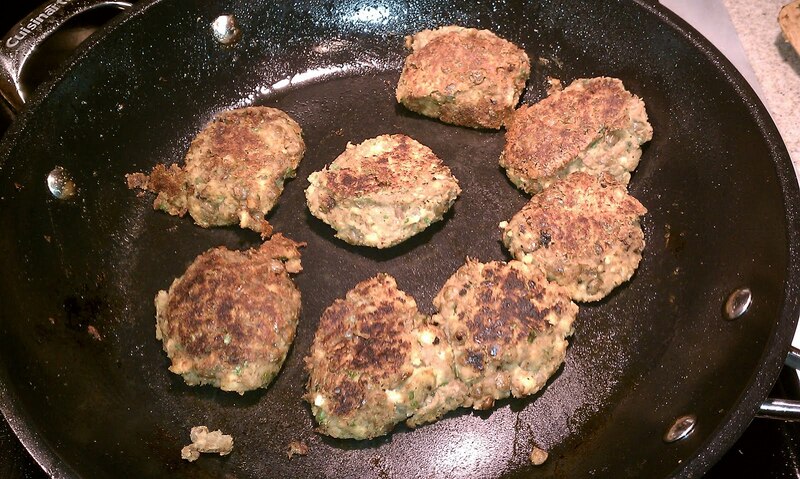 Working in 2 batches, cook the patties until browned, 3 to 4 minutes per side, adding the remaining tablespoon of oil to the skillet for the second batch. We had a HUGE zucchini in our CSA box last week. I wasn't sure what to do with it. I decided to hunt down a soup recipe given to me years ago by my friend, Martina. 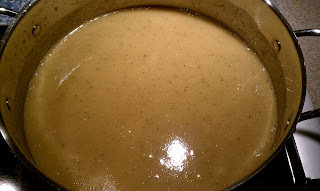 It was a zucchini soup recipe that makes some of the tastiest soup I'd ever had. Martina made it once for a dinner party, and none of us could guess what was in the soup. It had such a nice flavor, and I begged her for the recipe before I left. It couldn't be any easier to make this soup. I modified it to make it vegan, and it's just as delicious! Combine zucchini, broth, onion powder, garlic powder and salt in a large soup pot. Bring to a boil and cook for 10 minutes. Using a blender (I use a KitchenAid immersion blender - if you don't have one, I HIGHLY recommend you get one) puree the soup. Add in milk and serve. Makes 4-6 servings.